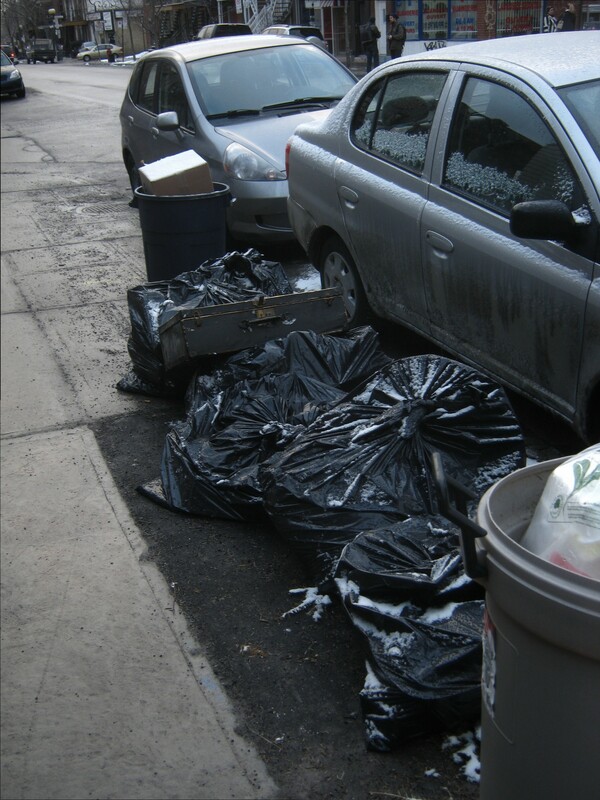 I came across this bunch of stuff on Masson when I went out for a brief trash run yesterday. It looked like someone was beginning to empty out a house that wasn’t their own. There was one bag just full of videotape recordings. A couple of bags were full of cleaning and renovation supplies. The old suitcase sitting on top contained old linens. Another bag held an assortment of cookware. I took a pyrex pot (which cleaned up nicely!) and these cast iron pans. 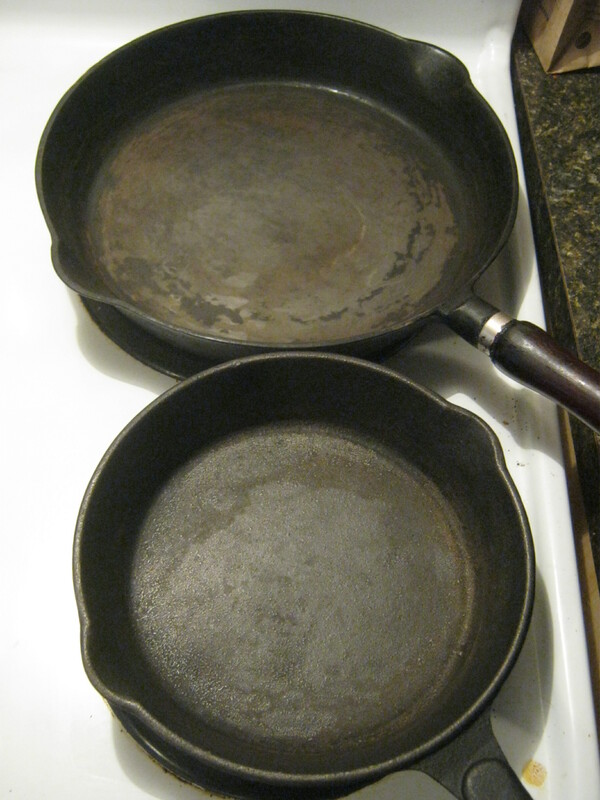 As you can see they were pretty grungy, but I like cast iron and have a strong stomach so I accepted the challenge of bringing them back to life. It turned out that the old owners were smokers. These pans let off that characteristic scent when I was washing them. That smell, albeit faint, was probably the nastiest part of the job. It took a lot of scrubbing and baking and a ruined piece of steel wool but I eventually cleaned off the vast majority of the gunk that was the old “seasoning.” The smell of smoke thankfully disappeared. Now I could add a new layer of seasoning, which basically involves covering the pan with a thin layer of oil and baking it for a while. With the fresh seasoning these pans looks way better! The big one in back could go for a second seasoning, but the little one is looking pretty much brand new. 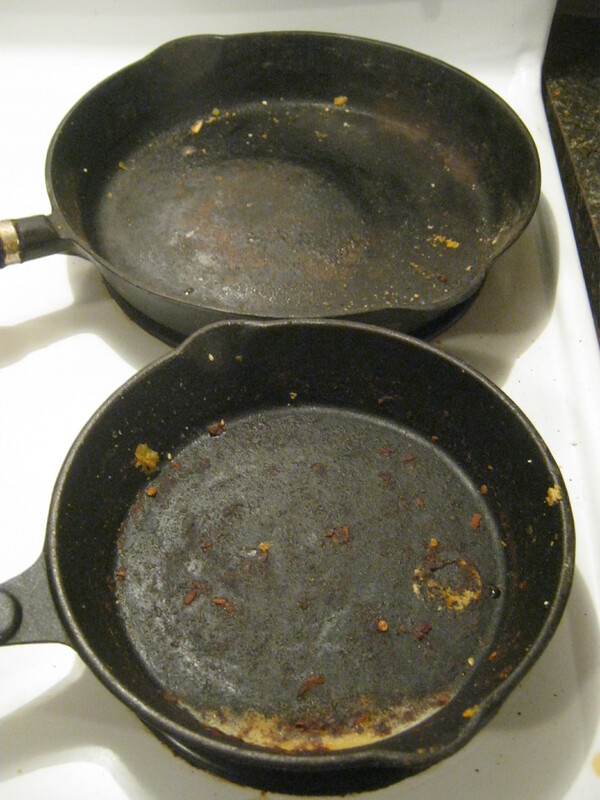 Just goes to show that cast iron pans never really die, they just need some lovin’. If you ever see old cast iron in the trash bring it with you. A little work and you’ll have yourself a pan for a lifetime. Great post, poetically written. Love the title; a clever turn of phrase. 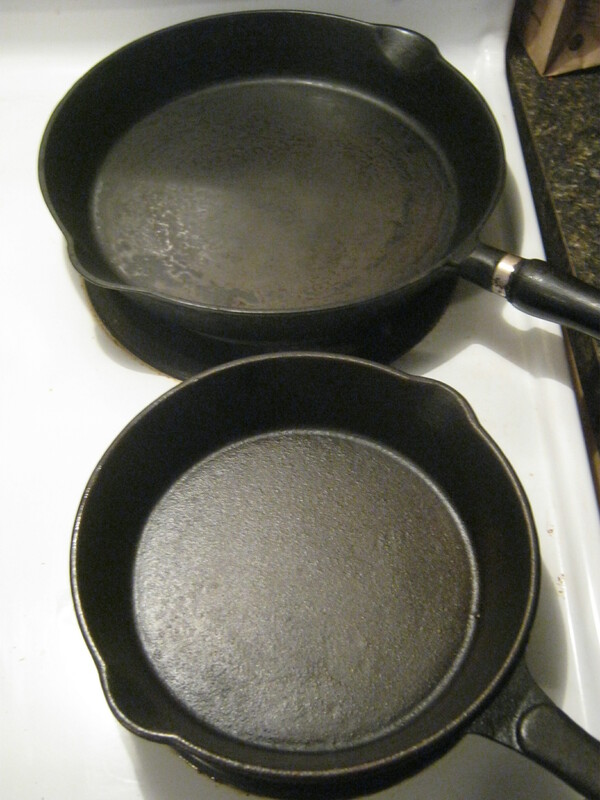 I’ve re-seasoned cast iron cookware myself – it was a godsend when I loved to cook, but was on a student budget – but none in the nasty condition you salvaged yours in. How wonderful that you saved these from the trash!